Certain aspects of EAC performance such as adequate airflow are fixed by the initial design or are dependent upon the local humidity conditions. These include the fan and duct size and cooling loads. However, there are other components that can be modified or replaced to improve the performance, reduce the supply air temperature, save energy and water, and extend the life of the unit. These modifications usually do not require special tools or certifications, but will require a determined approach to regular and consistent maintenance. These EAC tune-up tips are presented below. 1. Check that the entire face of the media is wetted during normal operation. If it is not, verify that the water distribution piping and header over the media is not clogged. 2. Check the pump for proper operation. Use a manufacturer approved strainer at the pump inlet to prevent internal fouling. 3. Verify that the pump is correctly sized for the unit. Consult the manufacturers literature and compare it to the pump nameplate data. 4. If the local electrical system is unstable for any reason, consider adding surge protectors to the 120-volt components, especially control systems that use microprocessors. 5. Check that float valve controlling the water level in the sump is set correctly. If it is set too low, it could starve the pump. If the level is set too high, the water in the media will overflow to drain when the pump is turned off and the media water drains back into the sump, wasting water. 6. Check that the bleed rate is set correctly for your water conditions. Refer to the section on water quality and the manufacturers recommendations to determine the proper flowrate. Testing your supply water for hardness level will set a basis for making adjustments. Consider using EAC chemical treatment to minimize bleed rate and conserve water. 7. Add a 4 inch “dead leg” on the internal water supply riser. Use a “Tee” connection under the supply riser pipe leading to the top distribution header on rigid media EAC’s to collect silt and debris by gravity. Periodically remove the end cap and flush debris. 8. Use a sump dump rather than a continuous bleed to save water, have cleaner sumps and extend media life. Media that is caked with mineral deposits is not as effective as clean media. 9. Check the water pressure on the roof. If it is over 50 psi; consider adding a pressure-reducing valve on the branch water line upstream of the water sump float valve, set at 30 – 35 psi. This will increase the reliability and extend the life of the float valve. 10. Check fan belts for frays, cracks and proper tension. Belts should not be forced over the pulleys, and should have approximately ½ inch of slack when measured halfway between the pulleys. Also, check for proper pulley alignment. 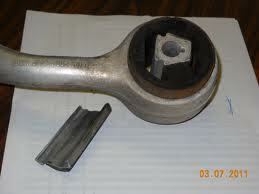 Check the fan and motor bearings for proper lubrication, but do not over-lubricate these. Rumble or chatter noises from the EAC should be investigated immediately. 11. Consider insulating the EAC cabinet. Products are available commercially that fit over a aspen pad cooler to help minimize the supply air temperature. See Appendix B. 12. Check for duct leakage, especially at connections to the EAC flex-connector, duct joints, diffusers and the seasonal slide damper. Seal all air leaks to maximize the volume of cool air flowing into the room. 13. Insulate all rooftop ductwork with rigid or wrapped fiberglass that is rated for exterior applications. Ensure that all insulation joints are sealed weather tight. 14. Replace the seasonal slide damper with an operable multi-blade damper. A good location for the new damper is in the main duct in the attic or ceiling cavity. Add this seasonal adjustment to the EAC maintenance list, and note the exact locations of all EAC dampers. 15. Get a copy of the T&B or “Test and Balance” and/or “Commissioning” report which was likely prepared when the building or system remodel was constructed. Compare the airflow rates to those specified on the “blueprint” plans especially for any problem rooms. A T&B technician will often adjust balancing dampers at the spin-in duct damper or at the room air diffusers so that the diffusers nearest and farthest from the fan get their share of air. Have the system rebalanced if tampering is evident or airflow problems persist. 16. Do a complete inspection of the relief air path between the room and the relief air openings to the exterior. Look in ceiling plenums to see if the air has a free path to the exhaust fan or the dampered opening. Inspect fire dampers usually located in the ceiling plenum near corridor walls, as these can sometimes accidentally spring close and block airflow. If the supply fan has insufficient pressure to move the air out of the building, consider adding an appropriately sized exhaust fan, and electrically interlock it with the supply fan operation. Relieve “used” EAC air through the attic space if possible. 17. Inspect all relief air dampers and adjust if necessary so the dampers go to full open when the supply fan is on high speed. Replace spring or weight operated barometric dampers with motor operated dampers, which are electrically interlocked to open when the supply fan is on. The use of insulated blade dampers will help prevent heat loss in the heating season. Many EAC problems can be traced to insufficient relief air area. 18. Add twist timers or microprocessor based thermostats to reduce EAC operation to occupied hours only. If you have setback thermostats, review the programming to ensure that the unit is scheduled to operate only during occupied hours. 19. Evaluate the benefits of commissioning or recommissioning your HVAC and related controls systems. Look at he results of previous “Test and Balance” reports to reveal inconsistencies and problem areas. 20. Use an automatic “pre-wet” cycle (which can be a feature of a microprocessor controller, see above) to start the sump pump around two minutes before the fan is energized. This will send only cool air into the conditioned space. Manual pre-wet instructions can be added to an EAC instructions note posted below the control switches. 21. If the supply fan motor has only one speed, consider replacing it with a two-speed motor and controls so that energy use and windage noise are reduced during periods of low cooling load. If the motor is greater than five horsepower, consider adding a variable frequency drive and controls to track the fan speed to the cooling load. 22. Evaluate a nighttime or morning “cold soaking” plan, especially if your EAC units were undersized. Cold soaking runs the coolers during the unoccupied hours when the wet-bulb temperature is low, to decrease the temperature of the mass within the building. Massive concrete buildings usually hold the cold longer than frame construction. The relief air control system must work automatically, as this will not work with closed windows. Also, ensure that the heating system will not automatically energize during cold soaking periods. 23. Be sure the cooler inlet is 10 feet away from, or 3 feet below, plumbing vents; gas flues; clothes dryer vents; or bathroom, kitchen, or laundry exhaust fan vents. a. Ventilated or insulated evaporative cooler top covers that shade the cooler from the sun. b. Canvas, plastic, Mylar and other materials for winter EAC wraps. c. Freeze protection devices (if necessary). d. Water saving devices, storage tanks, zinc anode systems, etc.. Comfort complaints come from various sources for various reasons. Some involve an individual’s particular metabolic rate, state of health, activity, age, gender, etc. The general rule: “You can’t please all the people all of the time” applies to HVAC systems. Nevertheless, there are complaints that can be clues to impending failures or deficiencies in the cooling, air distribution or building systems. Comments about insufficient cooling, high humidity, noise, vibration, smells or indoor air quality should be given immediate attention because they can save you time and money if repaired sooner rather than later. Some comfort issues can be addressed by educating the occupant how to operate the controls and the windows. Many complaints can be prevented by regular EAC system maintenance. Adiabatic Cooling: No change in the total heat of the air. 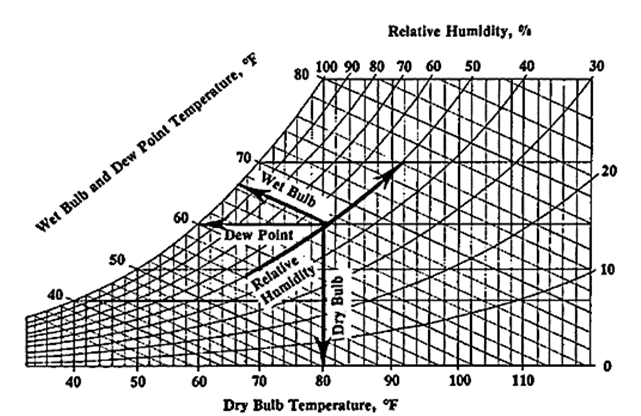 The air dry bulb temperature is reduced as moisture is absorbed, and the wet bulb temperature stays constant. Commonly pictured as “Up the Wet Bulb Line” on a psychrometric chart, as shown below. Same process as used in direct evaporative coolers.